Description: Join a team of fellow leaders on a unique – once-in-a-lifetime – journey into the heart of Asia, at the old meeting place between Tibetan saints and nomad warriors, learning from the rich culture of Buddhism in a setting of unspoiled nature. Setting: Our inner space determines who we are. Self knowledge and self-management are critical functions of leadership today. Yet in today’s busy and volatile world, we find little time for exploration of the inner world. While traversing an awesome landscape with rocky mountains, blue skies, wild yaks and ancient Buddhist monasteries, this journey will bring people to explore deeper levels of their minds. Learning from an ancient culture, with at its heart a spiritual practice of transformation (vayrayana), participants can renew and inspire themselves, and transform themselves as leaders. Program: The program starts with an individual intake and a meeting in the Netherlands where participants can connect and get a taste of the experience ahead. The journey takes us to the heart of the wild Tibetan mountains, deeply immersing ourselves in nature and exploring the depth of Buddhist wisdom and practice. After flying from Amsterdam to Chengdu, we will spend two days acclimatizing on the old Chinese-Tibetan border town of Xining, near the monastery of Kumbum (Taersi in Chinese). We will then fly over the expansive Tibetan plateau to Lhasa, where will adjust to the altitude and visit cultural highlights such as the Potala Palace and the ancient Jokhang temple. After three days in Lhasa we will leave for the mountains, ending up at Drikung Monastery where we will spend four days in pure nature living with a Tibetan nomad family. While camping near the monastery, we will be introduced into the philosophy and practice of Buddhism. We will spend our days under blue skies, experiencing meditative practice and going on long journeys on foot and horseback. The evenings we will dialogue with each other around the fire place, gazing at the deep moon-lit skies. 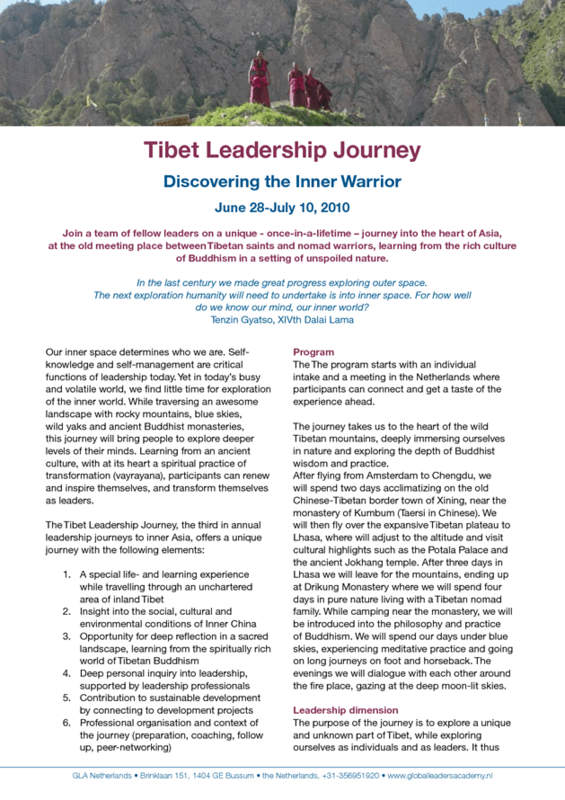 Leadership dimension: The purpose of the journey is to explore a unique and unknown part of Tibet, while exploring ourselves as individuals and as leaders. It thus differs fundamentally from the typical business travel or vacation – it really is an adventure. The focus is on the journey ‘within’, stimulated by introductions to the ancient spiritual culture of Tibet. Participants will be exposed to the rich world of Tibetan Buddhism, considered to be the pinnacle of contemplative and transformational science. Comfort is no more than a secondary objective. Participants are requested to prepare for this adventure mentally and emotionally. Global Leaders Academy (GLA) has run various leadership journeys, starting with the first Tibet Leadership Journey in 2007. GLA journeys address at least two levels of experience: outer and inner. Program activities will address these different levels on a consistent basis through expert meetings, open dialogue, coaching and personal contemplation. We will be meeting with local leaders, both formal and informal, in dialogue with the journey participants. Every day will start and end with reflection. Who will participate? This journey is meant for anyone who is courageous enough to explore him/herself ‘within’, who is willing to experience an ancient culture with a different worldview, and explore what all this means for him/her as a person and as a leader. Preference is for people who are willing to go beyond the comfort-zone, open to be challenged and transformed. Who will accompany you? The journey is designed and will be executed by professionals in leadership, Mongolian culture and Buddhism. Professional leadership development experts will join in the design of the program and will be an integral part of the team. The journey will be led by Sander Tideman and Reinier Tilanus. Sander Tideman lived and worked in Asia for many years. He visited Tibet regularly since 1990, co-founding the Bridge Fund, a leading NGO working in Tibet. He is a student and practitioner of Tibetan Buddhism since 1982. Reinier Tilanus is coach and trainer with many years of business experience. He is also student and practitioner of Tibetan Buddhism and has lived in Asia for several years.